Here we are going to present another most thrilling android game for you. This game is very similar to Temple Run Apk and Temple Run 2 Games but this game app provides you more fun and enjoyment as compare to previous mentioned games. That incredible game App is “Subway Surfers”. This is an endless running game as I said that this has resemblance with temple run games. In Subway Surfers, the characters are very different from temple run because there is no any demon or macho man running to save his life from monkey demon. Nevertheless, there is very young boy surfing on rail track and a police officer is following him to arrest him. There is a dog also with police officer both runs after the surfing boy. To save your life you have to run from police officer and his dog while you have to do slides jumps and skate to cross various hurdles on track. Track is endless and as I said, the track is based on railroad where you will face train coming from front side and you have to save yourself from crashing with those trains otherwise you will be fail to complete the game. There are various rewards present on the track that you can collect while running apart from those rewards you can collect gold coins, which you can use to buy new features, tools and for modifications of various tools. On every best performance, you get rewards and scores. Furthermore, you will be assign challenges that you will need to complete in reward you can get various power ups, gold coins, lives and many more. Subway Surfers game app is full of fun for android users. This game has been downloaded billions of time from Google Play or and Google Game Play so you can imagine its popularity. Now you can share your progress through social networks with your friends such as on Twitter, Facebook and many others. 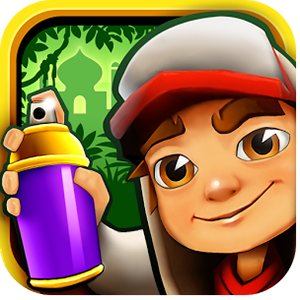 Download the latest versions of Subway Surfers form below download link, which we have provided you at the end of this page.